In Texas | Welcome to Texas. Click Here! Texas – actual position in the union is marked by advanced progress in space and oil industry. Texas became State in 1845 and white star was used on Texas flag in 1830, during battles between Texas and Mexico. In the history of all USA as a Country, Texas has a unique influence on development and progress. History of building up the Republic of Texas is full of colorful action. This flag was created by replacing the Eagle in the center of the Mexican tricolor with the year “1824”, referencing the 1824 Constitution of Mexico, in support of which Texas was fighting. This was the first flag approved for use by rebel forces by a Texan legislative body. In 1835, the Texan provisional government approved the use of this flag for privateers preying on Mexican commerce. It has been said that the 1824 flag was flown by Texan forces at the Battle of the Alamo. However, this was never alleged until 1860, long after the battle had occurred. Modern writers have pointed out that the presence of the 1824 flag at the time and place of the battle is highly unlikely. A similar flag was flown at least briefly by Texan Tejano forces, featuring two black, six-pointed stars in place of the date. It is likely that the actual “Alamo flag” referred to by accounts of the time was the Lone Star and Stripes, which had been depicted in use at earlier battles such as Goliad, and was widely referred to as the “Texian flag”.The Texas flag is known as the “Lone Star Flag” (giving rise to the state’s nickname “The Lone Star State”). This flag was introduced to the Congress of the Republic of Texas on December 28, 1838, by Senator William H. Wharton and was adopted on January 25, 1839, as the final national flag of the Republic of Texas. When Texas became the 28th state of the Union on December 29, 1845, its national flag became the state flag. From 1879 until 1933 there was no official state flag, although the Lone Star remained the de facto state flag, The Revised Civil Statutes of 1879 repealed all statutes not explicitly renewed and since the statutes pertaining to the flag were not among those renewed, Texas was formally flagless until the passage of the Texas Flag Code in 1933. Voice of the first man on the moon, Neil Armstrong was directed to Houston. (largest city in Texas, 4th in the US). Texas has more airports than any other State in the Country. The worst disaster in US history happened in Galveston. Hurricane demolishes city and kill 8000-12000 people. These days well restore and active After years State prosper well and spread GGT. (Go to Texas) for rest of Country. Even Hollywood got roots in Texas: Oscar, the Academy Award statue was named for Texan Oscar Pierce.Oscar, the Academy Award statue was named after Texan Oscar Pierce. Texas is the largest petroleum-producing State n US. Is ranked a 5th in the Word. Texas has it all what is coming to you as information on the subject of most complex topics, wonders, and desires. Space Shuttle with Mir Station in orbit to Green Industry and green pastures with cows, bulls, and longhorns. Not mention big ranchers with horses, bulls, and cows. Everything big is here in Big Texas. Office of Red Bull.com in Dallas and access window to any imaginable activity of the people on the planet of Earth. Where you can meet society as the whole of diversified culture and custom and society with closed doors to outsiders. The extreme task for athletics people with a wide spectrum of events, motorsports, bike, surfing, snow, games, escorts, music, adventures, skateboarding, paragliding. Red Bull.com, Red Bull.tv, Redbulletin.com Grow in Austria 27 years ago and is all over the world. An industrial word from oil and gas production, computers, cars, buildings with architecture, bridges, and highways to plane building and helicopters, fighters and drones to Green Energy Exploration and development. Just reach to Texas or GGT (go to Texas). Latitude around 30 deg south allows climate benefit wildlife and tropical vegetable.Gulf of Mexico and the Rio Grande south to Red River in the north. The river course, which follows the Rio Grande and separates the U.S. from Mexico, is, in fact, a delta, or floodplain. This large riparian area within the Chihuahua desert, where the river permits irrigation of croplands, is home to large tree species such as cottonwoods that have long provided shelter and food for birds and animals. Eg: Apache Canyon is by far the most significant natural and historical feature in the park and the most secret. The view of the Canyon quarry is spectacular. The Novaculite rock glistens and shines with its shiny colors of red, orange, and yellow. Apache Canyon is the site of a Clovis aged stone quarry. Prior to the recent desertification of Big Bend, it was a lush prairie providing the Native Americans with a hospitable living site while quarrying. More recently, the Canyon area was the site of a very successful ranch. A very large rock corral (still intact) and the ruins of the stone ranch house are impressive. Archaeology evidence of Native American habitation is scattered over the entire area. More than a million people live in the valley as it winds through Texas’ most southerly four counties, and the largest city — by far — is Brownsville. In the Big Bend area of Texas, where the elevation is low, many creatures that could not survive the desert mountain winters thrive, and there are even fish in the desert. Hummingbirds to crackles and crows, vultures to eagles, turtles and roadrunners, How to Texas became most popular search fraise among people with internet access over the word. Over 500 000 during 30 day period, people are searching for this term, for more information. So it is popular. Texas has it all. What more is offered when you are in Texas is just functionality of your imagination or needs and desire. Water, Gulf of Mexico beaches, lake beaches, rivers. Land, the well developed infrastructure of highways and roads in every part of State. Deserts: No part of Texas has rainfall levels low enough to be referred to technically as a desert, so certain plant and animal species — called indicator species — are used to determine what is and what is not. The presence of creosote bushes, mesquite, agave, ocotillo and other species is used to determine where the desert ends. 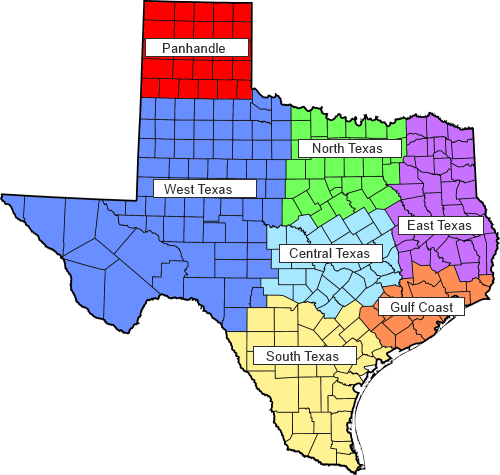 By that qualification, approximately 14 million acres of Texas, primarily in the southwestern part of the state, is desert; Texas comprises a total of approximately 172 million acres, so just around 12 percent of the state is desert. Hill Country is characterized by limestone hills broken with verdant drop-off valleys. Since the coming of the automobile, Americans have been building hunting camps, kids’ summer camps, religious retreats and full-time homes between Lampasas to the north, Hondo to the south, Round Rock to the east and Sonora to the west. Vacationers are well provided for with massive resorts and tiny inns. Fabulous cave structures are open to the public, including Inner Space Caverns and Natural Bridge Caverns, and this is still cattle country: Ranches and herds were seen in the landscape, and though cowboys more commonly drive pickups and four-wheelers today, seeing them on horseback is common. Down in the valleys, kayaking and tubing are as popular as swimming, gorgeous forests of virgin oak and other old-growth timbers fold and around granite and limestone outcrops, and unusual prickly pear, yucca, and Texas live oak can be found. Most significant part of Texas and omitted in much short info is South Texas and the Gulf of Mexico. Link for Space directives is situated at Houston, as NASA. Space Center Houston as the Official Visitors Center of NASA’s Johnson Space Center, home of astronauts training and Mission Control and the US live in connection with Space. This part of Texas has very well progressed in modern city development. It is a focus point for much international travel destination. Directly west from Houston is San Antonio with many amazing historical monuments and location. For two hundred years, San Antonio was a small fishing village, but it began to grow in the 1950s when many hotels and tourist resorts were built as part of tourism initiative. And grow is beautiful these days. Short distance (80 miles North/East) from San Antonio is located in Capitol City of Texas: Austin. The city grew throughout the 19th century and became a center for government and education with the construction of the Texas State Capitol and the University of Texas at Austin. After the Great Depression, Austin resumed its development into a major city and, by the 1980s, it emerged as a center for technology and business A number of Fortune 500 companies have headquarters or regional offices in Austin including Advanced Micro Devices, Apple Inc., Cisco, eBay, Google, IBM, Intel, Texas Instruments, 3M, Oracle Corporation and Whole Foods Market. Dell’s worldwide headquarters is located in nearby Round Rock, a suburb of Austin.The city grew throughout the 19th century and became a center for government and education with the construction of the Texas State Capitol and the University of Texas at Austin. After a lull in growth from the Great Depression, Austin resumed its development into a major city and, by the 1980s, it emerged as a center for technology and business. “How to Texas” is the keyword to find out how to play cards, Texas Hold’em. Got a half a million searches on Google search action by the public, every month. And have nothing to do how to reach DFW, Austin, Houston, San Antonio, El Paso, Amarillo. or hundreds destination point in 4th largest ( 2nd biggest) States in the United States of America. Airports have all year long traffic as Ports of Entry to the US. Texas Ports of Entry currently has 29 official U.S. ports of entry. More than any other state, according to the CBP website. With your desire to find the exceptional point of interest in Texas your main restriction is time. Long distances are on daily agenda for your visit. And factors like, business hours traffic jams, weather phenomena, (wind, tornados-average 137 per year), and some other reasons often coast changes to your agenda when you visit Texas. To discover places of the beauty of nature formation is an endless task to do in Big Texas. And surrounding States are forming an even bigger picture of Beautiful Area to Live and visit wonders all year long in Big Texas. Oscar, the Academy Award statue was named for Texan Oscar Pierce.